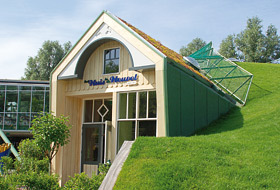 The green roof converts the unusual "Like-A-Leaf" architecture of the playhouse into a green hill. The hill is cordoned off temporarily when maintenance work has to be carried out on the green roof, mowing the lawn, for example. This little hut on the green roof is the starting point for a cable car for children. The gable-fronted dormer with its large glazed areas is literally resting in the middle of the green hill. In the steep pitched areas the plant community "Rockery type plant" provides for thick growth and lots of colour. The penetration-proof skylights are the only reminder that there are rooms under the hill. Expansive grassed areas alternate with the structure-providing picture of the plant community "Rockery type plant". The Georaster® areas are framed in by eaves profiles DP 120 for increased stability. The materials for the system build-up were lifted onto the roof using a cherry picker just-in-time and were used immediately. “Like-A-Leaf“ refers to the extraordinary architectural design of the new playhouse in Plaswijckpark, Hillegersberg, Rotterdam, which it is incorporated into the surrounding landscape just “like a leaf”. 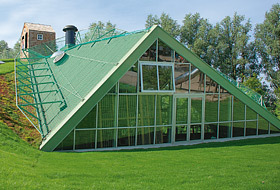 In addition to the extraordinary shape, it is the playhouse green roof in particular, approx. 1000 m² in size and with a pitch of up to 55°, that allows the building to merge with its natural surroundings. The ZinCo green roof systems that are used are specifically designed to suit the site and are adapted to the varying roof pitches. A 10-year warranty is provided for the entire roof build-up. The tradition that is Plaswijckpark goes back over almost a century to 1923 when it was originally set up as “Hillegersberg Tea Gardens” by the entrepreneur CAN Loos. By the 1930s this park was already a magnet, attracting thousands of visitors each year thanks to its rose gardens, birds and monkeys in cages, a playground with a carousel, boat hire and a pony and trap hire. The Plaswijckpark Foundation (Stiftung Plaswijckpark) was set up at the same time with the aim of ensuring the ongoing existence and further development of the park. In the mid-1970s, the competition grew steadily, offering alternative leisure facilities and Plaswijckpark found itself in financial difficulties. Since then, structural funds provided by the City of Rotterdam ensure the continual development of the park. 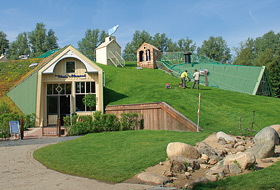 These days, the park is divided into three large, themed areas: “Wandelwijck“ (hiking area), ”Dierenrijck“ (animal area) and “Speelwijck“ (play area). The “like-a-leaf” playhouse is within the play area. Plaswijckpark has been an attractive facility on both wet and cold days since the playhouse was opened on 8 April 2013. By August 2013, 200,000 visitors had already visited the park. 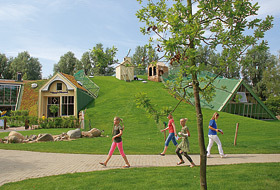 In the past, it was already the practice that when a new attraction was built, a green area was created in parallel in a different part of Plaswijckpark. In the case of the playhouse, this balance was actually achieved at the same location, as the green roof is part of the new design. “Like-a-leaf” is the brainchild of the architectural practice, Ssse|OvO Associates, in Amsterdam. The concept allows for a blurring of the border between landscape and building. 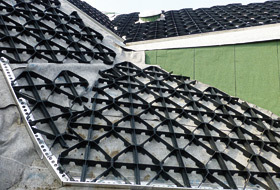 “Like-a-leaf” is an unusual roof structure comprising many smaller roof areas in which the edges of the “leaf” reach into the surrounding terrain. The building has taken on the shape of a hill, thanks to the green roof, and has become in itself a physical element within the park. This explains why the new playhouse is referred to as the “Huis in de Heuvel” (House in the hill). The front part of the building, above the restaurant, consists of a glass and steel construction. The surface structure here is folded “like-a-leaf” and the pergola is covered in vines, creating a connection to the green roofscape and the parkland. “Life-a-leaf” even reacts to the changing seasons as the size of the interior space expands or shrinks, depending on the season. During the summer months, one side of the lobby is open, allowing it to become an integral part of the exterior space, which has a main artery of the park running through it. During the winter season, the lobby is closed in, offering an additional interior space of 200 m². The entire interior space appears “like-a-leaf” to the visitor, as it were, given that the steel girders in the roof resemble the vein structure of a “leaf” and are visible from all areas within. Untreated pinewood from sustainable forestry is the material used between the steel girders. This has the effect of regulating humidity by absorbing or giving off vapour, depending on humidity levels in the room. 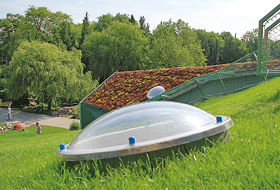 The situation on the green roof is similar where rainwater is stored and gradually given back to nature through evaporation. During the summer months, the green roof and the sunlight-resistant vines on the pergola provide natural cooling for the rooms. Therefore, the green roof also functions “like-a-leaf”, protecting the roof waterproof membrane by balancing the fluctuation in temperature, and contributes to environmental sustainability. The planning phase for this extraordinary “like-a-leaf“ concept, which began in 2009, naturally took a lot longer than the time required to carry out the build, which included not only the building itself but also the element “green roof”. The general contractor, Franjie B.V. commissioned the roofing company Mastum Daksystemen from De Meern with the installation of the roof waterproof membrane and the company Van der Tol B.V. from Amsterdam with the installation of the special green roof. Van der Tol B.V. is an experienced contractor and has been working with ZinCo green roof systems for almost two decades. Particularly with such unusual roof situations as presented by this project, expertise and experience on the part of the system manufacturer is vital for a project-specific and therefore permanently reliable solution. ZinCo Benelux B.V. was responsible for the detailed green roof planning which ultimately required two different green roof systems due to the varying roof pitches (in total 20 individual roof areas ranging from 7° to 55°). 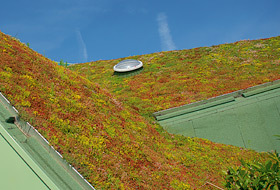 The Plaswijckpark Foundation was given a ten-year “Life on roofs” warranty for the entire roof build-up including the green roof. The client is, therefore, benefiting from planned reliability. Some smaller roof areas, however, were not actually greened during the project as planned but were marked out for the installation of green bituminous sheeting. The building works started in March 2012 and the green roof was installed in the spring of 2013. The green roof build-up systems appropriate to the roof pitch are installed upon the foundation of an expertly-installed, root-resistant bituminous roof waterproof membrane. In those parts of the roof with a pitch of up to 25° the ZinCo system build-up “Pitched green roof” begins with the installation of protection mat BSM 64 that has a particularly high water retention capacity of 7 l/m². 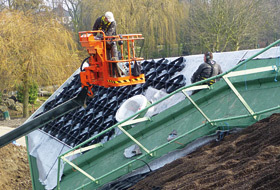 Next is the shear-absorbing drainage element, Floraset® FS 75. These boards (1 m x 1 m and 75 mm deep) are made of recycled rigid foam (EPS) and have drainage channels on their underside and solid studs on their upper side that interlock with the substrate to prevent slippage. The system substrate “Lawn”, adapted to suit the required green layer, was then applied. 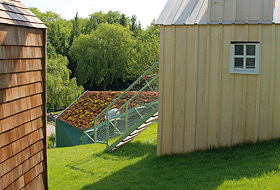 The system build-up “Steep pitched green roof” was used for areas of the roof with a pitch of over 25°. In this case, Georaster® elements 0.54 m x 0.54 m in size were installed over protection mat BSM 64. The Georaster® elements are made from polyethylene (HD-PE), have a reinforced shear-absorbing centre rib and are locked together using an integrated T-plug. The 100 mm deep Georaster® elements are filled with the particularly light-weight system substrate, “Rockery type plant – light”, with minimal covering. In the steep pitched roof areas, the Georaster® elements are framed with additional eaves profiles DP 120, which also help to safely draw off to the roof structure any shear forces that may arise. 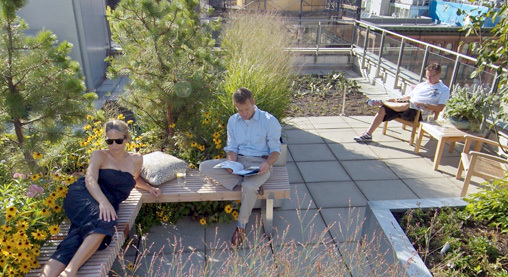 Generally speaking, green roofs can only be installed on roofs with a maximum pitch of 45°. However, for this project we provided a green roof solution for a roof pitch of up to 55°, as there were only a few small areas with this extreme pitch. The advantage of this particular roof situation was the size and the weight of the individual drainage elements that were easily lifted onto the roof with a crane and were installed on the different roof areas as required and interlocked with each other. Transporting the substrate onto the roof proved to be more complicated. It was delivered in big bags which were lifted onto the roof with a crane and was spread manually. The final layer, the vegetation, aimed to provide a varied picture: alongside the expansive lawn areas, the eye is drawn to various flowering sedum species, planted as pre-cultivated vegetation mats, particularly in those areas with a steep pitch. 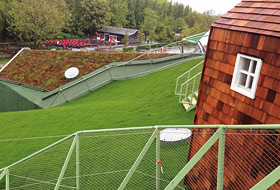 Thanks to a proven system technology, the roof as a green “hill” can be accessed from all sides and is intended as a stand-alone play and adventure area for frolicking around on the grass. There are small huts, an outdoor climbing area and a viewing terrace on the roof. Of course, you can have any amount of fun in the “House on the hill”: inside the two-storey house, in an area of 2400 m², children can get up to all kinds of things that they are not allowed to do at home: use the bed as a trampoline, play with bath foam or crawl through secret passageways. Ventriloquists appear on the partly-roofed theatre stage. There are lots more exciting things waiting to be discovered by the visitors in, on and all around the green “Hill”. With this project, the Plaswijckpark Foundation has created a new attraction for the park that not only goes a long way to satisfying the leisure time needs and wishes of the people but, thanks to the unusual architectural design, “Like-a-leaf”, also addresses to a great extent particularly environmental and landscape issues.